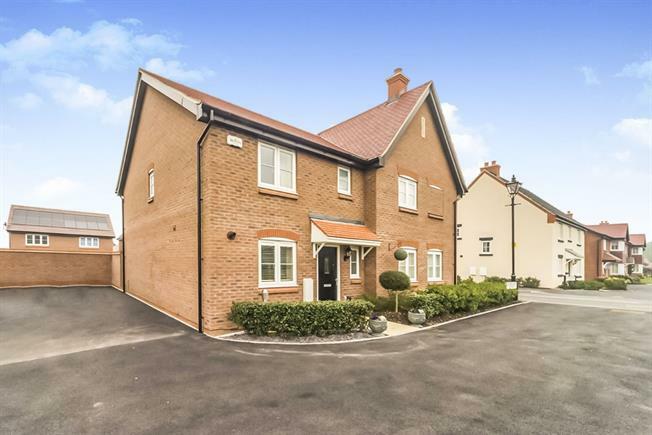 3 Bedroom Semi Detached House For Sale in Bedford for Offers in excess of £300,000. A very well presented three bedroom semi detached ex show home located in the popular south Bedfordshire village of Wootton. The property benefits from double glazing, radiator heating and a downstairs cloakroom. There is an open plan lounge/diner with French doors to the newly landscaped rear garden. There is a fitted kitchen with built in appliances. Upstairs there is an en suite shower to the master bedroom and a further double bedroom and single bedroom and fitted bathroom suite. Outside there is a an allocate parking space. Stairs to first floor. Doors to all accommodation. Radiator. Low level WC, wall-mounted sink. UPVC French double glazed door, opening onto the garden. Double glazed uPVC window facing the rear. Radiator. Double glazed uPVC window facing the front. Roll edge work surface, built-in units, one and a half bowl sink, integrated oven, gas hob. Double glazed uPVC window with obscure glass facing the front. Radiator. Low level WC, double enclosure shower, wash hand basin. Double glazed uPVC window with obscure glass facing the side. Heated towel rail. Low level WC, panelled bath, wash hand basin. Paved patio area leading to a landscaped rear garden. Rear access gate. Courtyard style front garden. Path to front door. Allocated parking space.